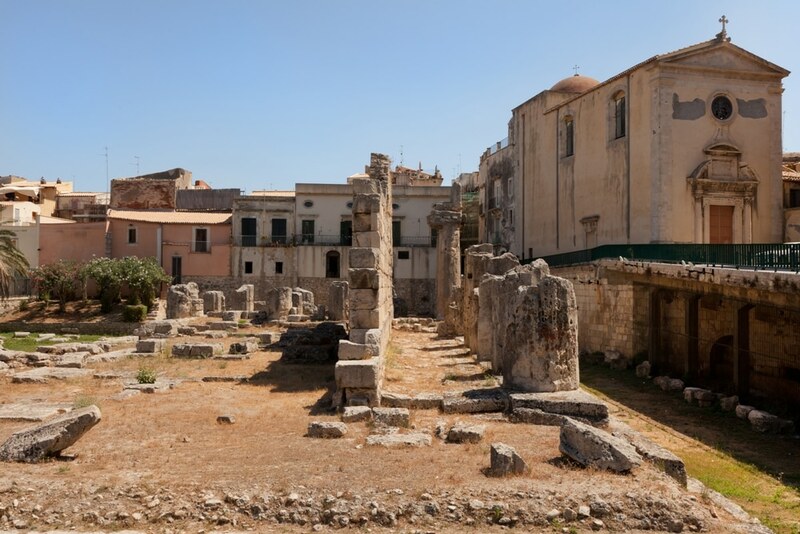 Ortygia – The Heart of Syracuse – Thanks to the minuteness in size of Ortygia, it’s easy to quickly learn your way about. The whole of Ortygia Island measures about two miles by a little over 1500 feet. Packed into its tiny size, however, is a more than 2500-year-old history. Viewing the tiny island’s architecture is like peering through the ages at the various styles employed, from Greek and Roman to Medieval and Baroque. Cafés and clubs line the small streets, and having a picnic lunch on the west side of the island offers a gorgeous view of the lagoon. When you arrive via the bridge, this western portion is to the right, and heading straight you’ll arrive in the center of town. Historically highlighting the western portion is the Arethusa Fountain. According to legend, Arethusa was a nymph from Arcadia. She fled into the water headed to Syracuse to end the amorous advances from the God Alpheios. Artemis assisted Arethusa by transforming her into the visible spring of today. This was a vain attempt to shelter Arethusa, however, because Alpheios is said to have finally found her and to have mixed the waters of his rivers with hers. It is also said that Arethusa’s spring is connected to Alpheios beneath the seas directly at Olympia’s sanctuary. Heading straight to the heart of the island you will come upon the ruins of Apollo’s Temple. It was built in the 600s BC and is said to be Sicily’s first Doric temple. Along Corso Matteotti you’ll find the Piazza of Archimedes, named after the most famous of the island’s past residents. From the Piazza of Archimedes, it’s a relatively short walk to Ortygia’s true center at Piazza del Duomo. Known as the true town’s square, here is where you will find all of the shops, cafés, and trattorias. You’ll also see the highlight of the town square, the magnificent cathedral built at the site of the Temple of Athena. What remained of the Temple was incorporated into the newly built cathedral, evidenced by the remaining columns utilized as the structure’s main buttresses. In a town square that threatens historical overload, you’ll also find Palazzo Beneventano and Santa Lucia Church.